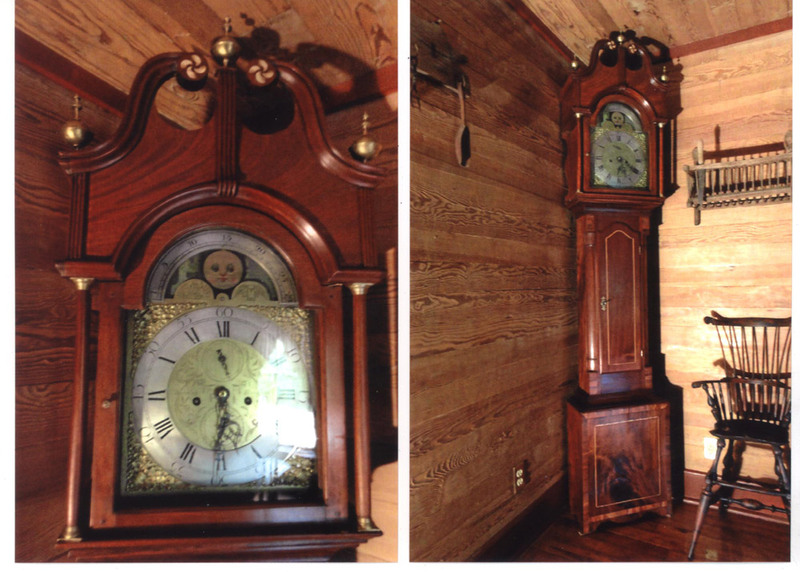 The clock was originally made by John Spinney out of Blandford England circa 1737. On the brass dial there are two rather interesting engravings. The first is an hour glass with a set of wings signifying that time flies. There is also a beehive and that has had different significance throughout time. In the early 1700’s it represented a social order. We all had a place and function in society and working together we could be a successful community. Twenty years ago the clock was dismantled for restoration. Once it had been taken apart the owner passed away. The clock then sat for nineteen years at which time his spouse also passed away. The heirs to the estate sold the clock at auction, dismantled and missing some parts and pieces. When I purchased the clock the lower door was off (hinges and lock cylinder were missing), the upper door on the hood was missing, both pillars on the hood were missing, and the clock had been stained a very dark color. The case was so dark that you couldn’t see any of the wood grain or inlay. I carefully sanded the case back down revealing the inlay and exotic wood grain. I discovered that there was a section of molding that was missing. At some point the molding must have broken off and the owner at the time decided to mask the missing molding by staining the case a very dark color, hence hiding the exposed secondary wood and all the nail heads. The molding I replaced with a piece that I had made using hand planes and a spoke shave. For the upper door on the hood I was able to locate some old growth Honduras mahogany. I did a mortise and tenon joint held together with wood pegs. I decided to inlay the two sand shaded fylfots for the broken arch top. I then purchased handmade brass hardware from England, which replaced what was missing. I didn’t use any satin on the case and simply finished it off with shellac and then applied wax and buffed by hand. What you see in the picture is the natural color of the wood. It is really amazing that such a wonderful piece of history had slipped into disrepair and almost forgotten. ———————————————————————————————————————————————————————————————–Fridays on the Highland Woodworking Blog are dedicated to #FollowFriday, where we use this space to further highlight a woodworker or turner who we have featured in our monthly e-publications Wood News and The Highland Woodturner. Would you like for your shop to appear in our publications? We invite you to SEND US PHOTOS of your woodworking along with captions and a brief history and description of your woodworking (Email photos at 800×600 resolution.) Receive a $50 store credit redeemable towards merchandise if we show your shop in a future issue.